St. Patrick’s Day is almost here. Normally all I do to celebrate is wear a little green and make some green dessert, but with a toddler, I am thinking about making some sort of craft with him. I like to joke to my friends and students that I am Irish, because of the red hair and freckles I have, but truth be told, it’s so far back in our family history that I can’t even claim I’m 1/42. Regardless, I love everything Irish. 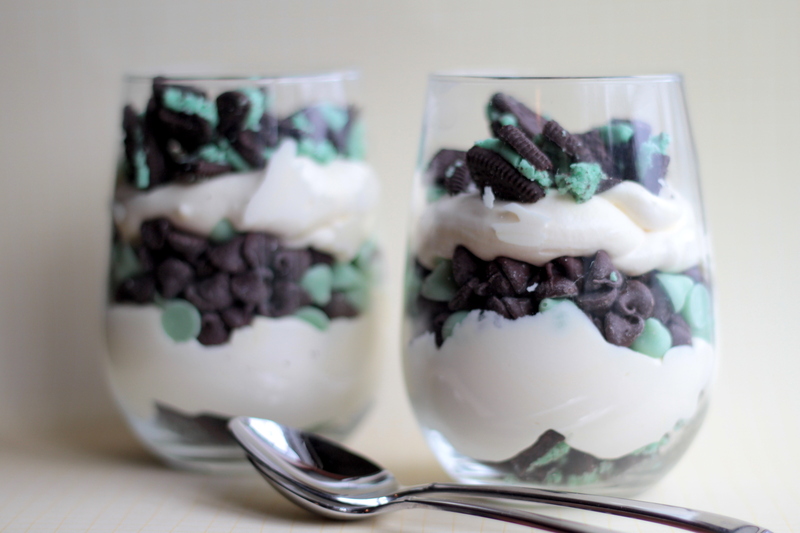 And when it comes to desserts, green, minty ones are at the top of my list. Whether or not minty (and/or green) things originated in Ireland is a moot point. P.S. After spending a whole, long weekend, I’m happy to say that our hardwood is almost completely installed. (Big thanks to my dad and father-in-law for helping. And my mom for keeping Matthew and me company!) I have my kitchen back! I’ll post some pictures soon on the before and after. We just need to finish up some of the trim and install the transition pieces. I feel like I have a whole new house! 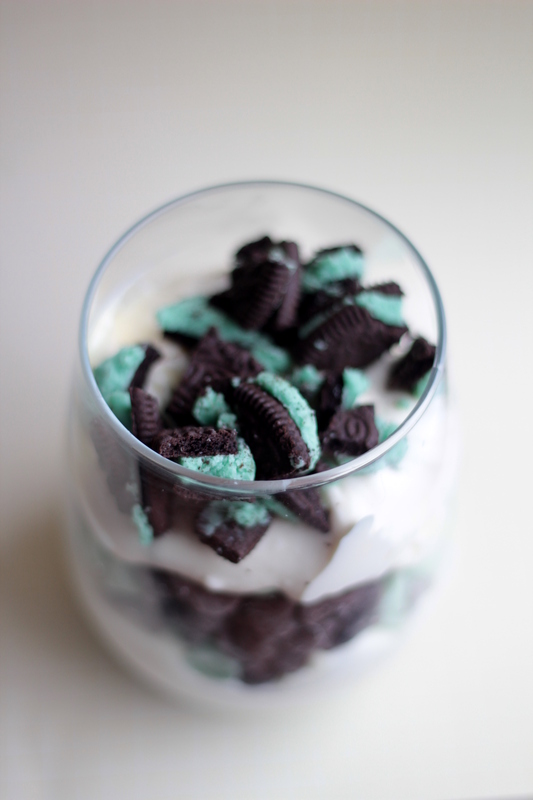 Crumble all the mint Oreos in a bowl by hand and set aside. In a mixing bowl with a paddle attachment, mix the pudding and milk on low speed for 2 minutes. Using a handheld mixer, combine the cream cheese and sweetened condensed milk together and mix until smooth. Fold in the Cool Whip; then fold in the pudding mixture. Sprinkle half the crushed Oreos evenly into a 9 x 13-inch pan. Spoon half of the pudding mixture evenly over the crushed Oreos. 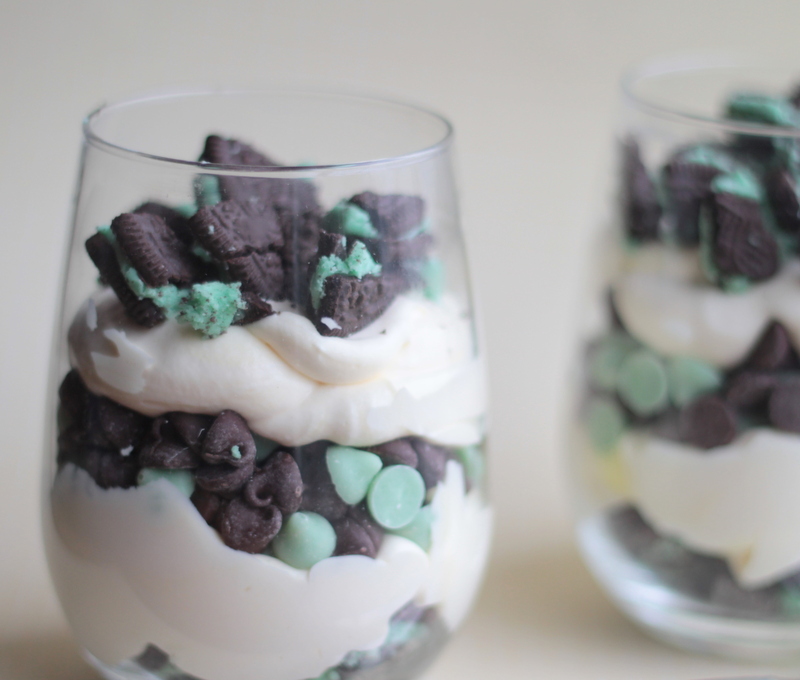 Sprinkle the chocolate and mint chips over the pudding mixture. Spoon the rest of the pudding mixture over the chips, spreading to evenly coat. Sprinkle the remaining Oreos over the top. Refrigerate at least 2 hours. Store any leftovers in an air-tight container up to 3 days. If you bought Rhodes glasses from Costco, I have the same ones! Looks delish. This looks delicious! 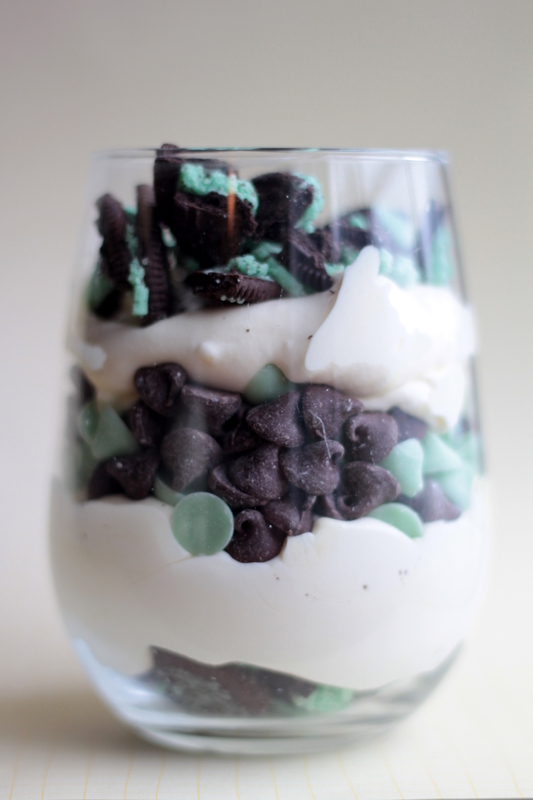 I personally love the mint oreo ice cream…unfortunately I ran out last night. That stinks! I love that flavor. Yummy as usual. I wish I could make all things mint, but the hubby despises mint. Argh! I know! What a bummer, ’cause mint is so tasty! !